For those of you who can get enormous pieces of flint! opps! didn't work.. A tombfrom the beggining of the elder Bonze age by certificates in ribe county contained flat chopped egg, tip and grip a sword, criminals have been made in wood. Like flat cut grip or aegdele acting as losfund in Jutland and on the island of Zealand. Flintaegsvaerd has been footswitch and doesnot entirly common. I fancy an egg sandwich for some reason! This is absolutely fascinating and answers a long time question of mine, why was the maquahuitl restricted to meso-america. 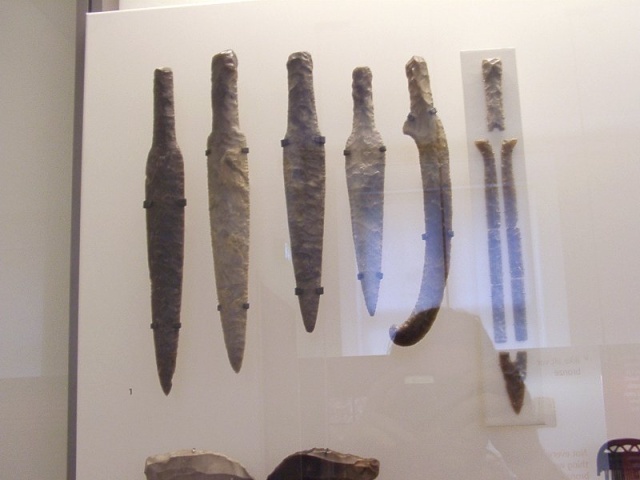 The tip on the sword is also pretty interesting, many similar hollow points are found across Europe and Africa and mostly interpreted as arrowheads. I've always thought what a weird inefficient design, perhaps these things were wider than Denmark? You don't know what they are called in Danish? Also what period they are from? I am fond of pigs. Dogs look up to us. cats look down on us but pigs treat us as equals. Found these pics and got a date, 3500-3700 years ago. 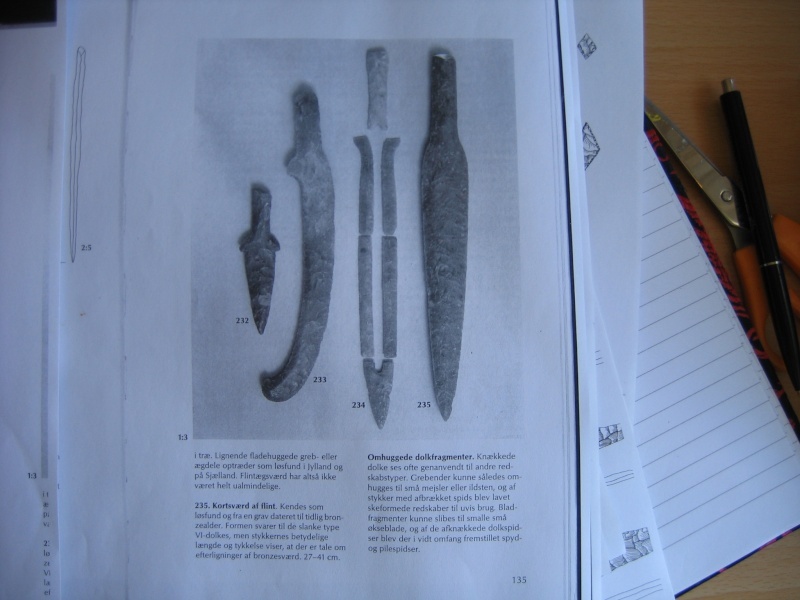 What's interesting form this pic is the blades are bifacial or unifacially knapped, from the book illustration I thought blade core. Wonder how they attached them to the wood. It's Flintaegsvaerd, I'm guessing flint edge sword and they do appear to be bificially knapped. The comosite one is from the early late bronze age if you know what I mean! 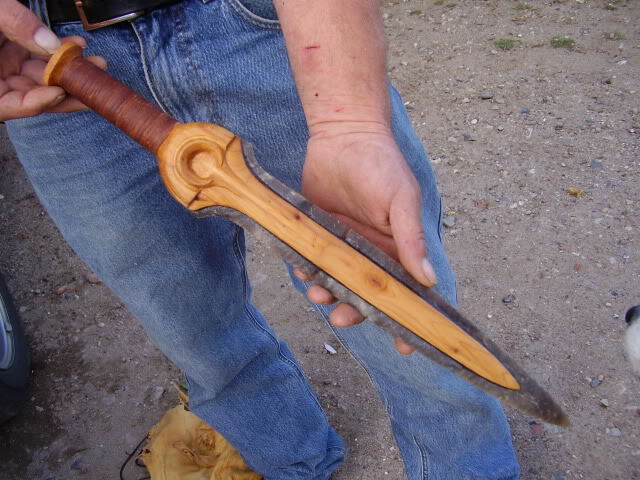 I found this picture of a flint edged sword the other day and I wish I could find out who knapped it to credit them with the best replica I've seen... of anything.......ever! Out of interest, would these swords be for practical use, ceremonial or the equivelent of the fake alarm boxes on the outside of a building. The impression I have is of this possibly filling the gap between the old flint weapons, and people who saw and wanted a bronze sword but weren't in the right 'catchment' area. Certainly, I would imagine they would be effective if your neighbours were still using sharpened sticks and simple flint knives. That's astonishing, ever since I first saw the pics I've been planning to have a go but stuck on how to go about it, this is really useful. My guess these swords for for people that couldn't afford bronze but just had to have what the royals are carrying, a keeping up with the Joneses thing. The local chieftain and all the rich merchants have got all that new-fangled bronze stuff which cost an arm and a leg, so the middle classes living in the detached roundhouses on the suburbs of the hillfort all got these as cheaper alternative. It looks highly usable, flint swords make great weapons as the Mexicans show, but may have been so costly it was only for show. Do you think the maker would supply replacement blades? Unclip the broken blade, and pop a new one in, like a razor? Although the manufacture of this piece must have stretched the knapper's skill, I wonder if these intricate blades were the last ditch products of a dying skill. It does feel as if they were filling a gap in the market for a local answer to the more modern metal weapon. After all, the big money was going to the bronze weapons, so the poor skilled knapper would be losing status, and finding his skills becoming less and less sought after. That means earnings start to fall. Now the people who had these swords may not have been either able to afford a bronze weapon, or maybe there was a bit of a waiting list. So as a knapper, you couldn't charge them as much for a flint blade however well made it was. Charge too much, and buying a bronze blade doesn't seem so out of reach. Still wouldn't like that flint sword waived around at me though. There are bronze age price lists surviving from Egypt. No bronze swords unfortunately but a bronze vessel seems to have cost more than a months wages, depending on how much you earn't. As for replacement blades I would guess you took it back to the maker for a repair. Now THAT'S what I call history. I'm with Mary Beard on this. It's the little stuff, the minutia of life that's important. It's the flint handle that stumped me at first, just how would it work? The replica has gone for a more conventional leather bound wood handle carved in one with the slotted mid blade. Then it struck me that it's most likely flat backed and there was origionally two, one for each side with wood in the middle. That would work. » Possible Danish stoneware, any thoughts?